Groupthink is an occurrence where by a group comes to a unanimous decision about a possible action despite the existence of fact that points to another correct course of action. This term was first given by Irving Janis who was a social psychologist. His main aim was to understand how a group of individuals came up with excellent decisions one time and totally messed up ones at other times. According to Irving, in a group sometimes there comes a situation when all the members of the groupthink it is more important to come to a unanimous decision than to carefully go through all their options to get at the most beneficial course of action. Some famous examples of group – think are the Challenger space shuttle disaster and the Bay of Pigs invasion. It has been reported that the engineers of the space shuttle knew about some faulty parts months before takeoff, but in order to avoid negative press, they went ahead with the launch anyway. In the second case, President Kennedy made a decision and the people around him supported it despite having their own doubts. In groupthink, the members of the group place emphasis on everyone agreeing and feel threatened if all do not agree on a course of action. This results on better options being overlooked, people overcoming their basic thoughts of providing alternatives, critiques or a new opinion. This results in poor decision making, unmet goals and problem solving. 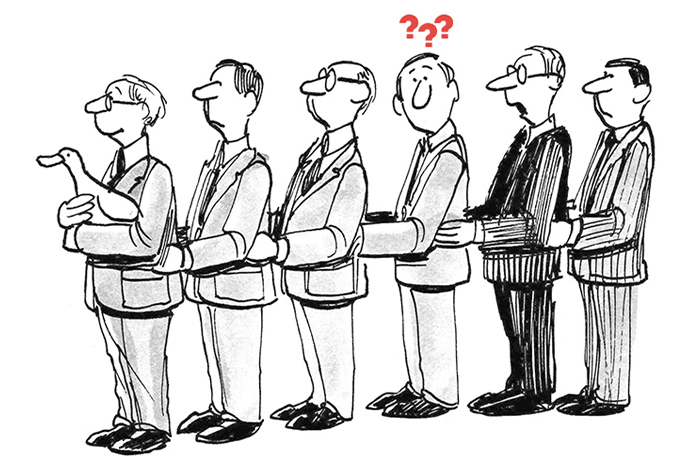 Groupthink occurs normally when there a strong sense of “we” in the group. In such a case people want to be on good terms with their group no matter what the cost. They try to maintain the harmony of the group and sacrifice individual critical thinking for groupthink. According to Janis Groupthink happens when there is a strong, persuasive group leader, a high level of group cohesion and intense pressure from the outside to make a good decision. Janis listed eight symptoms of groupthink: The first two stem from overconfidence in the group’s power. The next pair reflects the limited vision, members use to view the problem and the last four are signs of strong compliance pressure from within the group. Illusions of invulnerability: Here the groups display excessive optimism and take big risks. The members of the group feel they are perfect and that anything they do will turn out to be successful. Collective Rationalization: Here memebers of the group rationalize thoughts or suggestions that challenge what the majority is thinking. They try giving reasons as to why the others don’t agree and therby go ahead with their original decisions. Belief in Inherent morality of the group: There is a belief that whatever the group does it will be right as they all know the difference between right and wrong. This cause them to overlook the consequences of what they decide. Out – Group Stereotypes: The group believes that those who disagree are opposed to the group on purpose. They sterotype them as being incapable of taking their right decions and as being weak or evil. Direct Pressure on Dissenters: The majority directly threaten the person who questions the decisions by telling them that they can always leave the group if they don’t want to agree with the majority. Pressure is applied to get them to agree. Self – Censorship: People engage in self – censorship where they believe that if they are the only odd one out then they must be the one who is wrong. Illusions of unanimity: Silence from some is considered to beaceptance of the majority’s decision. Self – Appointed Mind Guards: They are members of the group who take it upon themselves to discourage alternative ideas from being expressed in the group. To avoid Groupthink, it is important to have a process in place for checking the fundamental assumptions behind important decisions, for validating the decision-making process, and for evaluating the risks involved. It is important to explore objectives and alternatives, encourage challenging of ideas, have back –up plans, etc. If needed gather data and ideas from outside sources and evaluvate them objectively. If at any point group – think is detected, go back to the beginning and recheck the initial alternatives, discuss in the group about the threats of group – think and then make an active effort to increase the effectiveness of decision making by analysing all angles. It is best to establish an open climate and assign the role of critical evaluator. Group Techniques like brainstorming, nominal group technique, six thinking hats, the delphi technique, etc can be used. Make it compulsory to go through certain practices like risk analysis, impact analysis and use the ladder of inference. Use a policy-forming group which reports to the larger group and use different policy groups for different tasks. I honestly believe that this is a spectacular page you have here. Is it ok if I like site on FB with your url and the tittle of your page:”Groupthink | Communication Theory”? I work in a high school, and after reading this information on group think, I’m motivated to present this idea as an after school project. Thank you! Groupthink can easily be managed by using Group Decision Support Systems like MeetingSphere, which I linked to. That gives the meeting facilitator total control to avoid groupthink. this is a nice article it helped me while preparing for exams……Am studying communication and its one of the theory we are doing….Thank you….